I work in a large, busy eye department in an NHS hospital. 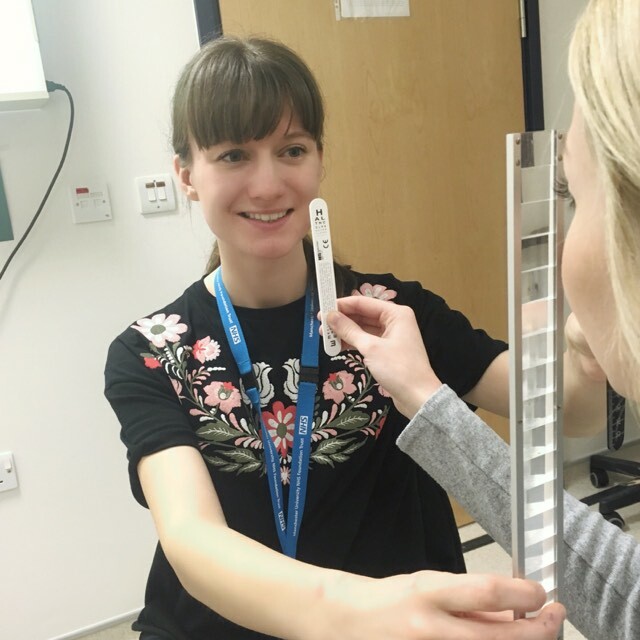 I am part of the ophthalmology team working with ophthalmologists, optometrists and orthoptic assistants. My role is to investigate, diagnose and manage patients whose vision hasn't developed as it should. Other patients may have double vision or squints. I really enjoy my job. It is really rewarding. I only graduated recently so it is great that my team are so supportive. I am also learning new things every day. In the future, I could specialise in areas such as stroke or low vision, teaching or even do my own research to make life better for patients everywhere. There is no typical day. I work with patients ageing from a few weeks to 100 years and the equipment I use helps me decide on how best to treat my patients. I see a lot of children with reduced vision and/or a squint. My day might begin with measuring a child’s squint so the doctor can decide on the surgery needed to straighten his or her eyes. I may then be assessing the visual responses in a two-week old baby who has cataracts. Other children might be having treatment to improve their vision due to a ‘lazy eye’. Every time they come to see me, I test their vision to check if it has improved. It’s brilliant when it has! Many of the adults I see have double vision. I try to find out why it has happened eg high blood pressure, diabetes, stroke, tumours, infections or multiple sclerosis. For many patients their double vision can be helped with a prism which is a piece transparent material that is fitted to their glasses. It's up to me to find right one and fit it. Double vision can drastically reduce quality of life so it’s very satisfying when patients I have helped are seeing single vision again.